A modern farmhouse aesthetic is all the rage these days, and in no space is that more true than in the kitchen. While a traditional farmhouse style kitchen features patterned wallpaper, natural wood tone cabinets and heirloom porcelain knick knacks, the modern version is all about light, bright, and open elements. So, just how is this look achieved? When designing a kitchen, the first thing you want to think about is the flooring. Whether or not you will have an open floor plan, matching the wood flooring to the rest of the house will help open up the space and add rustic charm. Don’t like wooden kitchen floors? Try a wood grain or white tile instead. 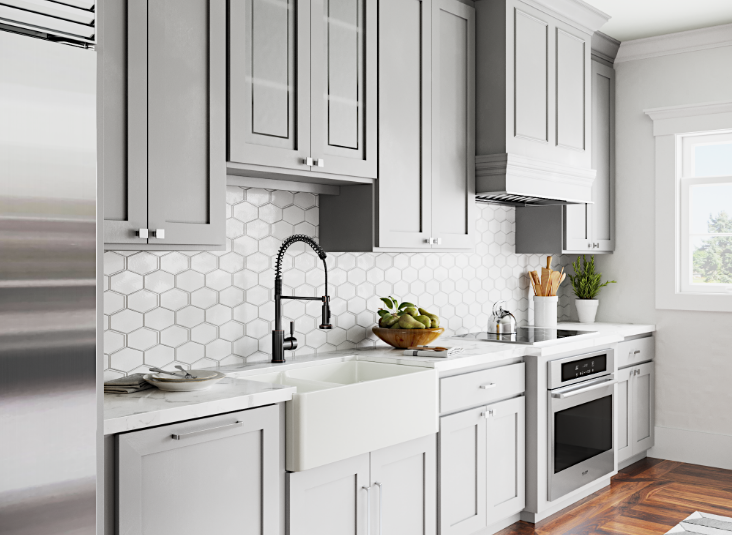 In order to create the illusion of a light airy space, go all white for cabinets, countertops, and the backsplash. An all white kitchen is clean, fresh, and bright. It is a safe bet when doing a remodel because of its timeless quality. Subway tiles are classic, but feel free to get creative with any style you like. Another great way to add rustic charm to a new kitchen is by getting hanging lights with an industrial vibe. Think iron chandeliers, white metal pendant lights, and galvanized dome sconces. Pair these with edison light bulbs for an extra touch of charm. Whether they are floating and sleek, or hung with rustic iron brackets, nothing says farmhouse like open shelving. Of course, you don’t have to go 100% open with your shelves, but one or two statement shelves on an otherwise bare wall to display classy copper cups and colored glass vases will go a long way to getting that magazine cover kitchen. Whether you prefer copper, fireclay, or stainless steel, the piece de resistance of a modern farmhouse kitchen is a large apron style sink. Top this off with a large, traditional style double handle faucet to complete the look. This classic combo of sink and faucet is great for everything from filling large pasta pots to giving the baby a hassle-free bath. The icing on the cake of a modern farmhouse kitchen is metal, glass, and wood accent pieces. Style this inviting room with handsome family heirloom looking pieces like glass pitchers, wooden fruit bowls, and cast iron bar stools. Remember, a modern farmhouse kitchen is clean, not cluttered, so stick to a few key statement pieces and keep everything else neatly tucked away.